We’ve got two new polls and a preview of this weekend’s Democratic State Committee meeting, along with reaction to the Pittsburgh Post-Gazette’s firing of longtime, award-winning editorial cartoonist Rob Rogers. Gov. Tom Wolf and Sen. Bob Casey share a strong position against GOP challengers with nearly five months left before election day, a newly released Franklin & Marshall College poll shows. Wolf leads former Sen. Scott Wagner 48 to 29 percent, according to the poll, while Casey leads Rep. Lou Barletta 44 to 27 percent. Both have maintained or extended their leads since March, when Franklin & Marshall conducted a similar poll. This weekend, the Pennsylvania Democratic Party will gather members for its summer meeting, scheduled to take place at the Sheraton Harrisburg Hershey Hotel. Saturday afternoon, the party will hold its general meeting to elect members to its executive committee — along with state party chair. New Public Policy Polling data shows incumbent Rep. Scott Perry (R-York) only four points ahead of his Democratic challenger, George Scott. 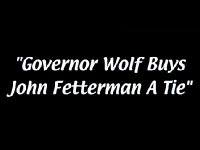 Wolf and Fetterman tap into some Always Sunny humor in their first ad together, and the passing of Senate Bill 22 saw some Democrats taking to Twitter to express their frustrations. And ICYMI, our story Tuesday evening outlining what the new SB22 is all about. Good morning, politicos, here’s the Playbook! A proposed state constitutional amendment creating an independent commission to oversee redistricting passed the state Senate today by a vote of 33 to 16. The bill, which has been in the works for more than a year, went through revisions as late as yesterday. And several people, mostly Democrats, were unhappy about the final version of the bill that passed. Nearly three years after Gov. Tom Wolf endorsed Braddock Mayor John Fetterman’s Senate opponent, the two have publicly made up with a sartorial settlement. As lawmakers prepare for a possible vote Wednesday on sweeping reforms to the state’s redistricting process, Senate Republicans on Tuesday introduced a new amendment that would create election districts for judges.